Why does over use of antibiotics result in higher mycoplasma contamination rates? | Bionique® Testing Laboratories, Inc. There is a trend among cell culture researchers to rely on the routine use of antibiotics in their cultures to avoid microbial contamination. After all, what harm can occur? Besides masking poor aseptic technique, the over reliance on antibiotics can increase the harshness of contamination complications. This widespread practice is also a major cause of mycoplasma contaminated cultures. Leading cell culture experts strongly discourage the general use of antibiotics in culture (Coecke et al., 2005; Fogh et al., 1971; Wolf and Quimby, 1973; Freshney, 2000; Lincoln and Gabridge, 1998; McGarrity, 1976; McGarrity et al., 1985). The following section will explain in detail the scientific basis for this recommendation. 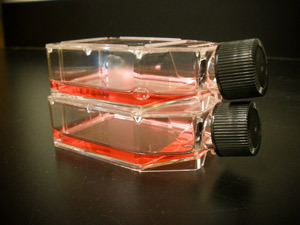 Most cell culture contamination results from the accidental introduction of fungi or bacteria, sometimes along with mycoplasma, into a cell culture often as a result of a breech in aseptic technique. The event can occur at any step which involves the handling or manipulation of the cultured cells or their media. The source may be aerosols, dusts, improperly sterilized products or mishandled reagents. These contamination events usually introduce mixed populations of microorganisms into the culture system. If any of these microorganisms finds the culture conditions supportive for growth, then soon the few become many. Figure 4a - Adding antibiotics to cultures makes it more difficult to detect microbial contamination. Without antibiotics in the culture system, some of the introduced microorganisms would soon be detected through gross visual cues, such as turbidity or color changes in the culture medium (Figure 4a). Usually, microscopic evaluation would follow, perhaps supplemented by additional microbial testing. At this point the culture is generally discarded and the loss of the culture is the only damage. However, in a culture containing antibiotics there are four possible outcomes, three of which have serious consequences. The first (and only positive) outcome is when the antibiotics prevent the growth of contaminating microorganisms. After all, this is the reason antibiotics are added to the medium. Unfortunately, due to widespread antibiotic resistance, this favorable outcome is not guaranteed. Instead, one of the next three outcomes is more likely and problematic. The second outcome is when one or more of the contaminating microorganisms are completely resistant to the antibiotics in the medium. The contaminants will rapidly grow and, hopefully, be detected visually within several days. Ideally, the discovery is made prior to release of the cultures for experiments or other applications. The third possible outcome is worse and often more costly. It results when one of the contaminating microorganisms has partial resistance to the antibiotics. As a result, a latent or low level contamination becomes established in the culture which can go undetected for weeks or longer. Due to this potentially longer period of cultivation, this situation poses a more substantial risk for the laboratory or facility. Partial resistance creates more opportunities for infected cultures to cross contaminate other cultures, be transferred to other researchers or used in experiments or bioproduction. The last outcome is, by far, the most detrimental and occurs with a polymicrobial contamination event of mycoplasma with other microorganisms. This is usually the case with aerosol droplets from the mouths of laboratory personnel. Because of the difference in antibiotic susceptibility, these agents may prevent the cultivation of the easier to detect contaminating bacteria or fungi, but are unable to prevent the mycoplasma from becoming established. This is a likely occurrence, since the antibiotics routinely used in culture medium have minimal effect on mycoplasma. As seen in Table 8a, data from Bionique® Testing Laboratories, documented the antibiotic resistance of mycoplasma isolates from infected cell cultures: streptomycin 88%, kanamycin 73%, gentamicin 80% (Lundin and Lincoln, 1994). As a result, there is an absence of visible signs to indicate the culture has been contaminated with mycoplasma. Had antibiotics not been used, then the other easier to detect contaminants would have quickly taken over the culture, been observed and the culture discarded. This explains Barile's observation that cell cultures routinely grown in antibiotic containing media had 10-fold higher rates of mycoplasma contamination (72%) than cultures grown antibiotic-free (7%) (Barile, 1973). It also explains why M. orale, a mycoplasma found in the human oral cavity, has always been the single most common isolate detected in contaminated cell cultures (Drexler and Uphoff, 2002) (Table 5a). Often overlooked concerning the use of antibiotics in cultures are their effects on the host cells (Table 4a.). A number of morphological and functional changes can arise from the addition of these agents to cell culture media (Kuhlmann, 1996). Consequently, these interferences with the cells and changes in cell culture conditions may affect the results of experiments. Furthermore, the lack of standardization in cell culture conditions resulting from the use of antibiotics compromises the comparability of experimental results (Kuhlmann, 1996). Thus the routine, continuous long-term use of antibiotics in cell cultures actually creates more problems than solutions. However, there are useful roles for antibiotics in cell culture, primarily for short term therapeutic applications, as in the first two weeks within a primary culture. In this instance, the antibiotic-containing medium should be replaced with fresh medium every two to three days because of the instability of the antibiotic (Kuhlmann, 1996). Once the antibiotics have been discontinued, sterility testing should be deferred until the cells have undergone at least three additional passages. Antibiotics also have a role in cultures used for teaching and training purposes, at least in the early stages of a program. Under these conditions, there is an increased risk for mycoplasma and other microbial contamination. As a result, these cultures should be segregated from cultures used for research or production with separate designated laboratory areas, equipment, media and reagents. As in vitro research and applications continue to expand, the use of antibiotics in cell cultures should not be used in lieu of stringent, proper aseptic techniques to reduce or prevent microbial contamination. *Note: These changes are dosage and cell type dependent.